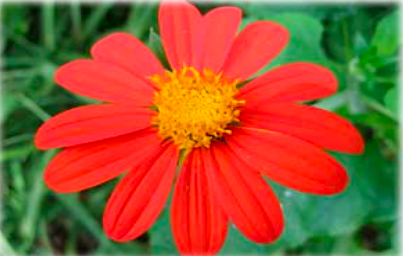 Fast Facts: The Mexican sunflower is a member of the Asteraceae family. It is also known as the tithonia. Mexican sunflowers grow to a height of 5 to 6 feet. Most specimens are between 3 and 4 feet wide. Dwarf versions are also available that reach a height of only 3 feet. The Mexican Sunflowers pedals are usually red and orange. The flowers resemble daisies and are approximately 3 inches across. Needs lots of sun well drained soil likes hot weather. Step 1 Choose a site with average to poor, well-drained soil in full sun. Step 2 Plant seeds directly in soil after your region’s last average frost date. Or start seeds indoors six to eight weeks earlier. Step 3 Thin plants to about 2 feet apart. Step 4 Keep soil evenly moist, but don’t overwater – this flower likes it a little on the dry side. Step 5 Trim faded flowers to promote longer blooming. Step 6 Fertilize every 8 to 10 weeks, or work in a slow-release fertilizer (or plenty of compost) at planting time. Step 7 Tear out and discard plants in fall, after frost fells them.